Protesters begin Bangkok 'shutdown' Jump to media player Protesters have begun blocking roads in parts of the Thai capital, Bangkok, in a bid to oust the government. Thai protests stoke economy concerns Jump to media player Thailand's tourism industry is now starting to feel the heat of political protests in Bangkok and there's concern other sectors could be affected too. 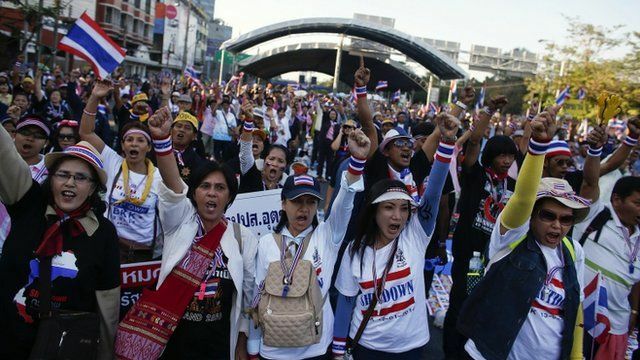 Will Thai protests hurt business morale? Jump to media player According to a survey, executives in Thailand are among the most optimistic in the region. But will the latest protests hurt their morale? Thai opposition holds warm-up protest Jump to media player Opposition supporters have marched in their thousands through the centre of the Thai capital, Bangkok. Protesters have begun blocking roads in parts of the Thai capital, Bangkok, in a bid to oust the government before snap elections on 2 February. The protesters are building barricades and occupying key road junctions. The BBC's Jonathan Head, who is in Bangkok, has been outlining the strength of the opposition demonstrators.